We’d love your help. 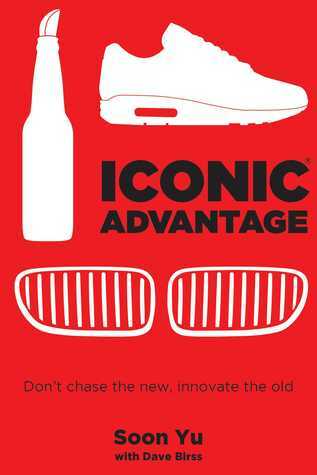 Let us know what’s wrong with this preview of Iconic Advantage® by Soon Yu. Too many businesses become enamored by shiny new objects and end up overlooking the value locked away in their existing products. Maybe your business Don’t just chase the new – Innovate the old. To ask other readers questions about Iconic Advantage®, please sign up. Iconic Advantage manages to be both an accessible introduction to branding and also a useful exercise in refreshing your thinking about how you can make your brand distinctive and loved. Soon Yu and his writing partner, Dave Birss, say upfront that what they share "isn’t anything particularly new,” but they provide great value by walking you through an easy-to-understand framework for how to make your product or service “iconic.” They’ve packed a ton of interesting insights and case studies into Iconic Advantage manages to be both an accessible introduction to branding and also a useful exercise in refreshing your thinking about how you can make your brand distinctive and loved. Soon Yu and his writing partner, Dave Birss, say upfront that what they share "isn’t anything particularly new,” but they provide great value by walking you through an easy-to-understand framework for how to make your product or service “iconic.” They’ve packed a ton of interesting insights and case studies into a relatively slim book (175 pages), which is welcome news for all of us who find that business books can sometimes be packed with some unnecessary padding. Their central thesis is that companies often spend so much time chasing the next shiny new thing that they forget to protect their core strengths. At the same time, this doesn’t mean clinging to the status quo. “When we say ‘innovate the old,’ people sometimes interpret it as ‘don’t do anything new.’ But that’s not the message we want to give at all. It’s all about focusing your innovation effort in the right place." The only downside to the book for me was the penultimate chapter, “Activating Iconic Advantage.” It felt too rushed and I would have liked more detail here. This chapter felt almost shorthand for some important guidance. In contrast, the previous chapter, “Capturing Your Iconic Brand Language,” dives deep on developing a document that the whole company will use to inform their decisions. My much-underlined copy of Iconic Advantage has easily won a place on my shelf of favorite business books, and I’m looking forward to putting into practice some of the concepts as well as the ideas inspired by this book. Very simple and quick read on understanding why brands need to create an iconic framework around being relevant and distinctive. If you’re an experienced planner/Strategist, a lot of this is not a surprise, nor are the supporting points/texts, but it’s a great 101 for newer strategists or folks who are trying to understand how to give their business more of an edge in a lasting way. Case studies could have been a bit more interesting and varied. A good introduction to the purpose of branding for those who don’t know and a good reminder for those who do know about branding that it’s about much more than marketing. It’s about creative distinctive, iconic brands that withstand the world of trends. A fresh perspective on marketing -- I highly recommend! A great reference tool for marketers! 3 simple principles , elaborated well to showcase how it works . Soon Yu is an international speaker and best selling author on innovation and design who has been featured in the Wall Street Journal, Washington Post, Entrepreneur Magazine and New York Times. His upcoming book, Iconic Advantage®, challenges businesses, from Fortune 500 to venture-backed startups, to refocus their innovation priorities on building greater iconicity, and offers deeper insights on Soon Yu is an international speaker and best selling author on innovation and design who has been featured in the Wall Street Journal, Washington Post, Entrepreneur Magazine and New York Times. 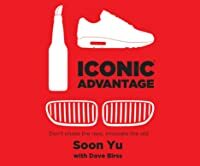 His upcoming book, Iconic Advantage®, challenges businesses, from Fortune 500 to venture-backed startups, to refocus their innovation priorities on building greater iconicity, and offers deeper insights on establishing timeless distinction and relevance. He regularly consults business leaders on developing meaningful Iconic Signature Elements, Signature Moments and Signature Communication.